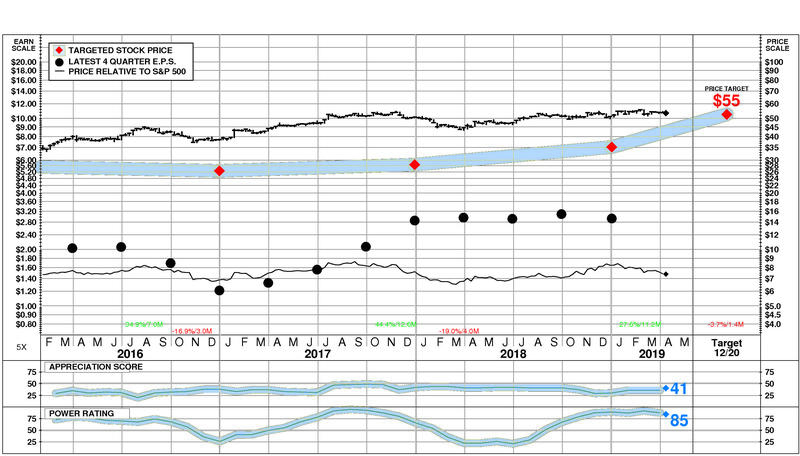 HomeResearchRating Update: Stock Rating B-Positive (4/11/19)-Rogers Communications Inc (RCI). Rating Update: Stock Rating B-Positive (4/11/19)-Rogers Communications Inc (RCI). Rogers Communications Inc. operates as a communications and media company in Canada. The company’s Wireless segment offers wireless telecommunications services to consumers and businesses under the Rogers, Fido, and chatr brands; and wireless devices, services, and applications. This segment distributes its products through independent dealer networks, company-owned retail stores, retail chains and convenience stores, e-commerce sites, call centers and outbound telemarketing, and other distribution channels. As of December 31, 2017, it had approximately 10.5 million subscribers. The company’s Cable segment provides high-speed broadband Internet access, digital television and online viewing, phone, and home Wi-Fi services to consumers, businesses, and enterprises; and monitoring, security, automation, energy efficiency, and smart control services. RCI’s future returns on capital are forecasted to exceed the cost of capital. Accordingly, the company is expected to continue to be a major Value Builder. Rogers Comm has a current Value Trend Rating of B (Positive). The Value Trend Rating reflects inconsistent signals from PTR’s two proprietary measures of a stock’s attractiveness. Rogers Comm has a neutral Appreciation Score of 41 but a good Power Rating of 85, with the Positive Value Trend Rating the result. Rogers Comm’s stock is selling at targeted value. The current stock price of $53.46 compares to targeted value 12 months forward of $53. Factors contributing to this good Power Rating include: is in an extremely strong phase current; recent price action has been favorable; and earnings estimate behavior for RCI has been slightly favorable recently. RCI’s financial strength is average. Financial strength rating is 59. 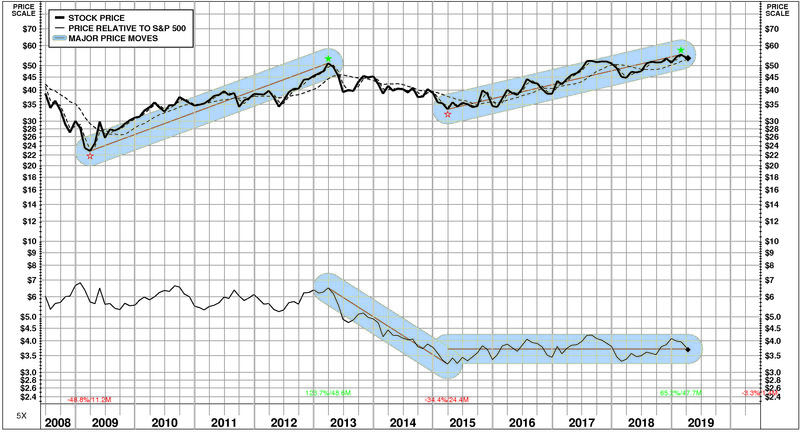 Relative to the S&P 500 Composite, Rogers Communications Inc has both Growth and Value characteristics; its appeal is likely to be to investors neutral towards Income; the perception is that RCI is normal risk. Relative weaknesses include: low financial strength, high financial leverage, and low expected growth. RCI’s valuation is moderate: moderate dividend yield, moderate P/E ratio, and moderate price/book ratio. RCI has normal market capitalization. Rogers Comm’s current operations are stable. Return on equity is falling. Rogers Comm’s current technical position is very strong. The stock price is in a 11.2 month up move. The stock has appreciated 27.6% from its prior low. The stock price is above its 200 day moving average which is in an uptrend. Rogers Communications Inc (NYSE: RCI) has benefited from meaningful positive changes in investment behavior: its shorter term price trend turned up. Rogers Communications Inc (NYSE: RCI) has recently experienced minimal negative changes in fundamentals: significant quarterly sales deceleration occurred. The stock is currently rated B. On 4/11/19, Rogers Communications Inc (NYSE: RCI) stock enjoyed a major increase of 16.2%, closing at $0.20. However, this advance was accompanied by below average trading volume at 79% of normal. Relative to the market the stock has been exceptionally strong over the last nine months but has declined -1.6% during the last week. In 2018, Rogers Comm generated a very significant increase in cash of +$297 million (                                ). Sources of cash were much larger than uses. Cash generated from 2018 EBITDA totalled +$4,374 million. Non-operating uses consumed -$155 million (-4% of EBITDA). Cash taxes consumed -$183 million (-4% of EBITDA). Re-investment in the business amounted to -$1,949 million (-45% of EBITDA). On a net basis, debt investors removed -$1,210 million (-28% of EBITDA) while equity investors pulled out -$580 million (-13% of EBITDA). Rogers Comm’s Non-operating Income, %EBITDA has exhibited little to no overall change over the period. This stability was accompanied by stability for the Rogers Communications Inc Peer Group as well. In most years, Rogers Comm was in the second quartile and top quartile. Currently, Rogers Comm is above median at -4% of EBITDA (-$155 million). Rogers Comm’s Cash Taxes, %EBITDA has exhibited little to no overall change over the period. This stability was accompanied by stability for the Rogers Communications Inc Peer Group as well. In most years, Rogers Comm was in the top quartile and second quartile. Currently, Rogers Comm is above median at -4% of EBITDA (-$183 million). Rogers Comm’s Business Re-investment, %EBITDA has exhibited a volatile overall uptrend over the period. This improvement was accompanied by an opposite trend for the Rogers Communications Inc Peer Group. In most years, Rogers Comm was in the third quartile and lower quartile. Currently, Rogers Comm is slightly above median at -45% of EBITDA (-$1,949 million). Rogers Comm’s Debt Investors, %EBITDA has experienced a very strong overall downtrend over the period. This downtrend was accompanied by stability for the Rogers Communications Inc Peer Group. In most years, Rogers Comm was in the second quartile and top quartile. Currently, Rogers Comm is substantially below median at -28% of EBITDA (-$1,210 million). Rogers Comm’s Equity Investors, %EBITDA has enjoyed a strong overall uptrend over the period. This improvement was accompanied by a similar trend for the Rogers Communications Inc Peer Group. In most years, Rogers Comm was in the third quartile and top quartile. Currently, Rogers Comm is slightly below median at -13% of EBITDA (-$580 million). Rogers Comm’s Change in Cash, %EBITDA has exhibited little to no overall change over the period. This stability was accompanied by stability for the Rogers Communications Inc Peer Group as well. (Since 2014 Change in Cash, %EBITDA has experienced very sharp improvement.) In most years, Rogers Comm was in the second quartile and top quartile. Currently, Rogers Comm is upper quartile at +7% of EBITDA (+$297 million). Rogers Comm’s Cash, %Revenue has exhibited little to no overall change over the period. This stability was accompanied by stability for the Rogers Communications Inc Peer Group as well. 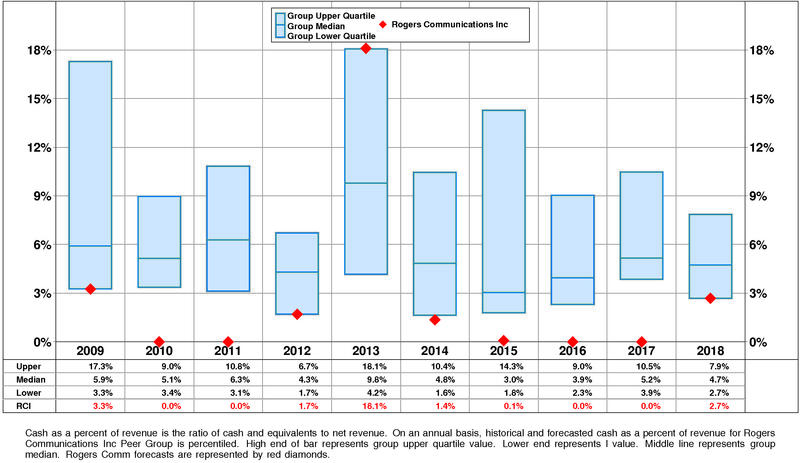 In most years, Rogers Comm was in the lower quartile. Currently, Rogers Comm is at the lower quartile at +3%. RCI’s return on equity has eroded very significantly since 2009 but it experienced a very sharp recovery after the 2016 low. This very significant erosion was due to very strong negative trend in pretax operating return and very small negative trend in non-operating factors. The productivity of RCI’s assets declined over the full period 2009-2018: asset turnover has suffered a very strong overall downtrend but it experienced a small recovery after the 2015 low. Reinforcing this trend, pretax margin has experienced a downtrend although it experienced a very sharp recovery after the 2016 low. 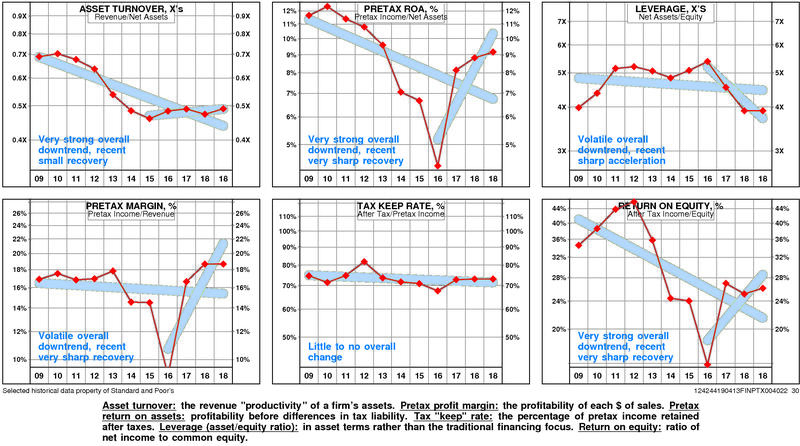 Non-operating factors (income taxes and financial leverage) had a very small negative influence on return on equity. RCI’s return on equity is upper quartile (26.1%) for the four quarters ended December, 2018. Operating performance (pretax return on assets) is upper quartile (9.2%) reflecting asset turnover that is at median (0.49X) and upper quartile pretax margin (18.7%). Tax “keep” rate (income tax management) is at the lower quartile (73.1%) resulting in after tax return on assets that is at the upper quartile. Financial leverage (leverage) is at the upper quartile (3.90X). Overall, Rogers Communications’ growth rate has slowed considerably in recent years. 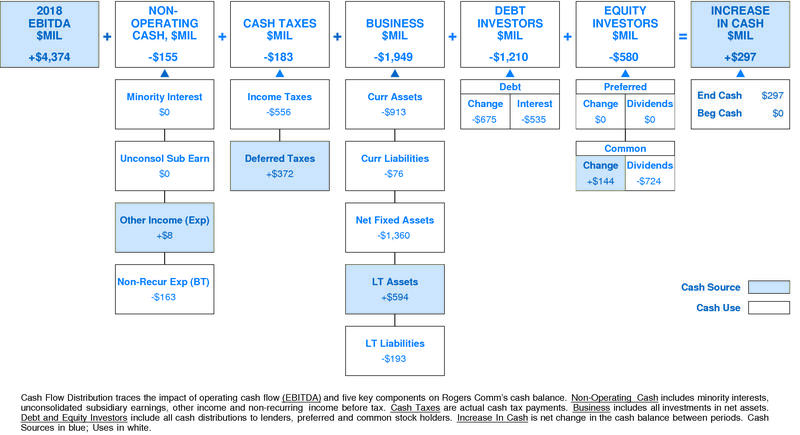 Rogers Communications’ historical income statement and balance sheet growth are not available. Annual revenue growth has been -0.1% per year. Rogers Communications’ consensus growth rate forecast (average of Wall Street analysts) is 5.3% — above the average of the historical growth measures. Relative to the Rogers Communications Inc Peer Group, Rogers Comm’s historical growth measures are generally third quartile. Equity growth (5.4%) has been above median. Total asset growth (4.5%) has been slightly below median. Revenue growth (-0.1%) has been below median. E.P.S. growth (-0.1%) has been substantially below median. Consistent with this pattern, consensus growth forecast (5.3%) is also below median. Over the full time period, Rogers Communications’ stock price performance has been below market. Between June, 2008 and April, 2019, Rogers Communications’ stock price rose +38%; relative to the market, this was a -39% loss. Significant price moves during the period: 1) March, 2015 – February, 2019: +65%; and 2) March, 2009 – March, 2013: +124%. Current annual total return performance of 24.0% is upper quartile relative to the S&P 500 Composite. 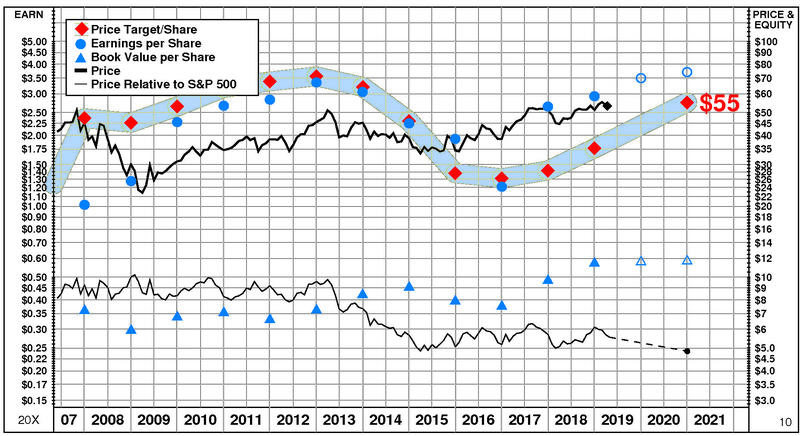 In addition to being upper quartile relative to S&P 500 Composite, current annual total return performance through March, 2019 of 24.0% is upper quartile relative to Rogers Communications Inc Peer Group. Current 5-year total return performance of 9.2% is slightly below median relative to the S&P 500 Composite. 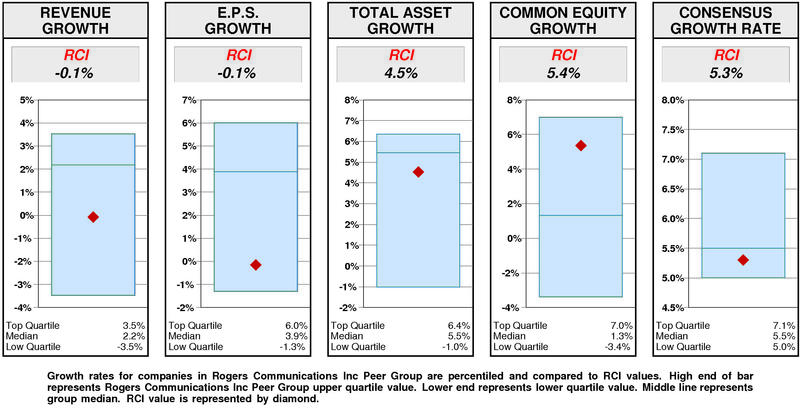 Through March, 2019, with slightly below median current 5-year total return of 9.2% relative to S&P 500 Composite, Rogers Comm’s total return performance is at the upper quartile relative to Rogers Communications Inc Peer Group. 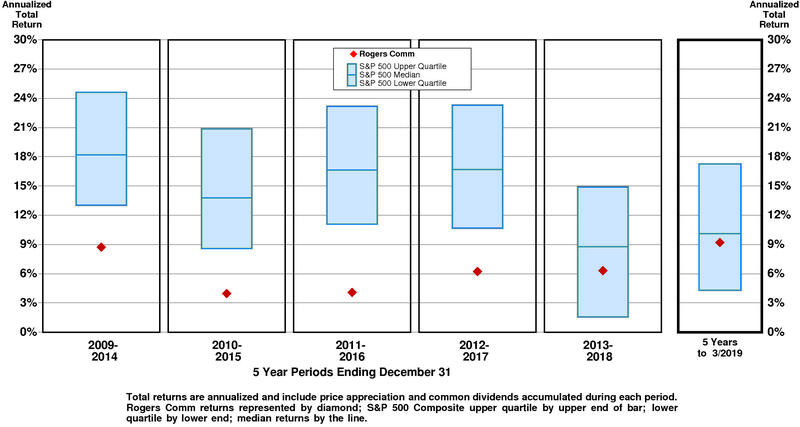 Relative to S&P 500 Composite, RCI’s overall valuation is low. The highest factor, the price/equity ratio, is slightly above median. Ratio of enterprise value/assets is slightly below median. Ratio of enterprise value/revenue is slightly below median. Ratio of enterprise value/earnings before interest and taxes is at the lower quartile. The lowest factor, the price/earnings ratio, is near the lower quartile. Rogers Comm has a large value gap compared to median valuation. For RCI to fall to lower quartile valuation, its current ratio of enterprise value/revenue would have to decline from the current level of 2.91X to 2.68X. 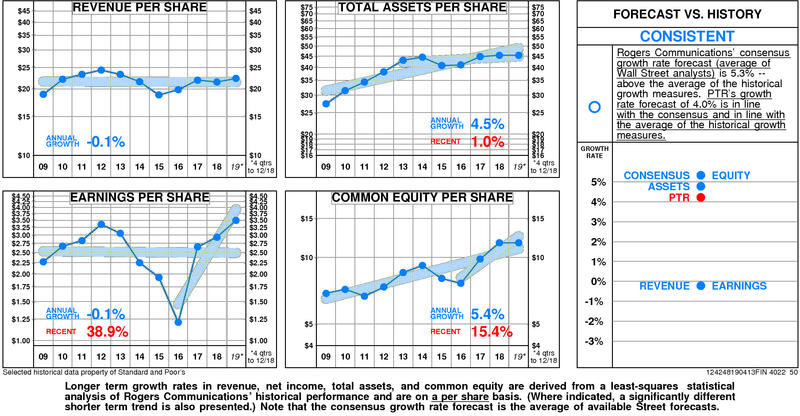 If RCI’s ratio of enterprise value/revenue were to decline to 2.68X, its stock price would be lower by $-7 to $47. For RCI to achieve upper quartile valuation relative to the Rogers Communications Inc Peer Group, its current ratio of enterprise value/revenue would have to rise from the current level of 2.91X to 3.41X. If RCI’s ratio of enterprise value/revenue were to rise to 3.41X, its stock price would increase by $14 from the current level of $53. Rogers Communications’ current Price Target of $55 is little changed from the current price of $53.46. With this neutral Appreciation Score of 41, the high Power Rating of 85 results in an Value Trend Rating of B.
Rogers Communications’ current Price Target is $55 (+57% from the 2018 Target of $35 and +3% from the 04/11/19 price of $53.46). This dramatic rise in the Target is the result of a +2% increase in the equity base and a +54% increase in the price/equity multiple. The forecasted increase in growth has a very large positive impact on the price/equity multiple and the forecasted increase in return on equity has a large positive impact as well. Partially offsetting these Drivers, the forecasted increase in cost of equity has a slight negative impact. PTR’s return on equity forecast is 30.1% — above our recent forecasts. Forecasted return on equity suffered a dramatic, variable decline between 2010 and 2018. The current forecast is significantly below the 2011 peak of 44%. PTR’s growth forecast is 4.0% — slightly above our recent forecasts. Forecasted growth suffered a dramatic, variable decline between 2010 and 2018. The current forecast is well below the 2012 peak of 11%. PTR’s cost of equity forecast is 10.2% — in line with recent levels. Forecasted cost of equity enjoyed a dramatic, steady decline between 2010 and 2018. The current forecast is steady at the 2010 peak of 11.0%. At Rogers Communications’ current price of $53.46, investors are placing a positive value of $13 on its future investments. This view is consistent with the company’s most recent performance that reflected a growth rate of 0.0% per year, and a return on equity of 26.4% versus a cost of equity of 9.6%. 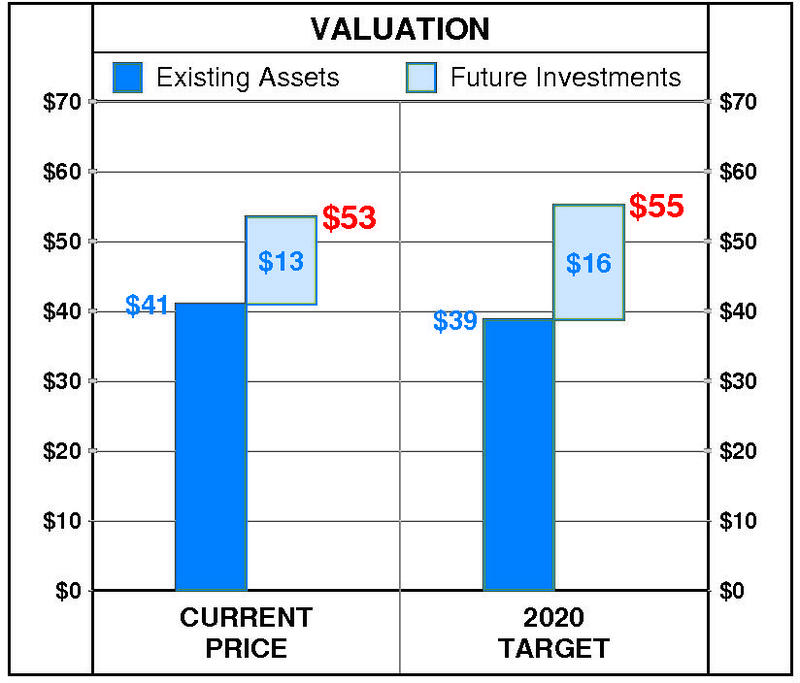 PTR’s 2020 Price Target of $55 is based on these forecasts and reflects an estimated value of existing assets of $39 and a value of future investments of $16. Rating Update: Stock Rating A-Highest (4/11/19)-Continental Materials Corp (CUO). Rating Update: Stock Rating C-Neutral (4/11/19)-Commerce Bancshares Inc (CBSH). Rating Update: Stock Rating B-Positive (4/18/19)-Rogers Communications Inc (RCI). Rating Update: Stock Rating B-Positive (4/17/19)-Rogers Communications Inc (RCI). Rating Update: Stock Rating B-Positive (4/16/19)-Rogers Communications Inc (RCI). Rating Update: Stock Rating B-Positive (4/15/19)-Rogers Communications Inc (RCI).